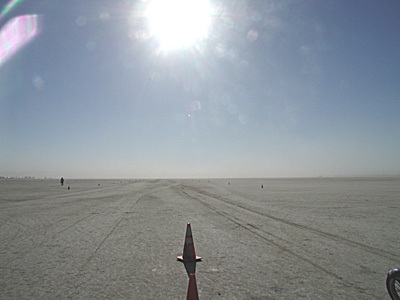 Twice a year, the Southern California Timing Association sets up electronic timing devices on the Bonneville Salt Flats, and racers come from all over the world to set records. The first really fast ride across the salt happened in 1911, when David Jenkins rode his Yale motorcycle 60 miles-per-hour to see a prizefight in Reno, Nevada between James Jefferies and Jack Johnson. 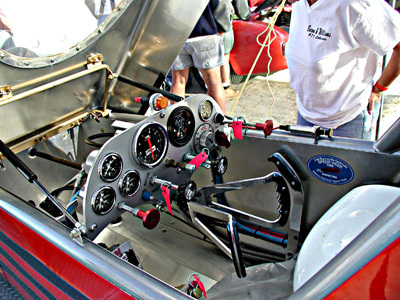 Ever since, gearheads have been running homebuilt speedsters on the salt. 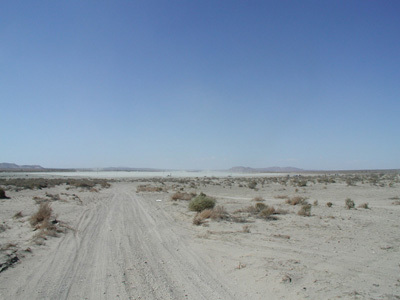 Since you can only run there a couple of times a year, all the guys from Southern California have been looking for somewhere else to run, and they found it in the dry lake bed at El Mirage, California. View from the starting line. Entering the lake bed. 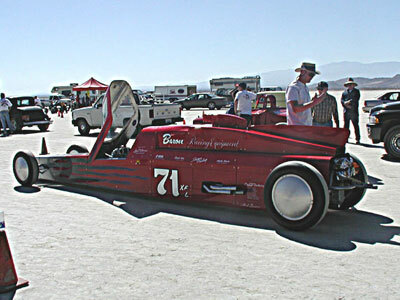 The SCTA hosts five meets a year where you can run-what-you-brung and try to set a land speed record. I wanted to run the Ferrari, but Id have to install a full roll cage, and that would sort of ruin the look of the car. Ive known Tony Baron and his wife Claudia for a while, now. Tony owns Baron Racing, like his father before him, a company that makes speed parts to go on Ford flathead V8 motors. His machine (Baron-Williams lakester #71) has gone 206 mph, and should go faster. Its a Ford flathead with a B & M blower that puts out 400 horsepower. Theres not much to the dashboard (note the parachute knobs and fire supression), but its all functional. Whats great about this group is that the whole thing is so informal. 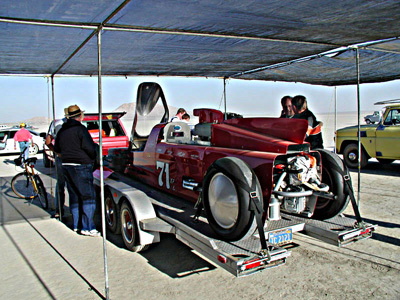 Mechanics sit in their garages over the winter, dream up some wild idea for a land speed car, build it, and come try it out at El Mirage or Muroc or Bonneville. Theyve been doing it the same way for 90 years. Very few rules (just a roll cage,fire suit and fire extinguisher), just pick a class and build something. I talked to Don Vesco at the Van Nuys car show. He recently held the wheel-driven land speed record with his Turbinator. 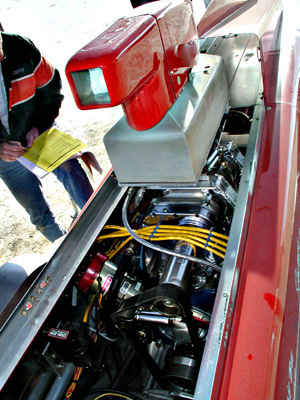 Its powered by a Lycoming helicopter turbine that puts out 6,000 horsepower. He bought it at a garage sale at Art Arfons. Remember the Green Monster jet car? That was Art. 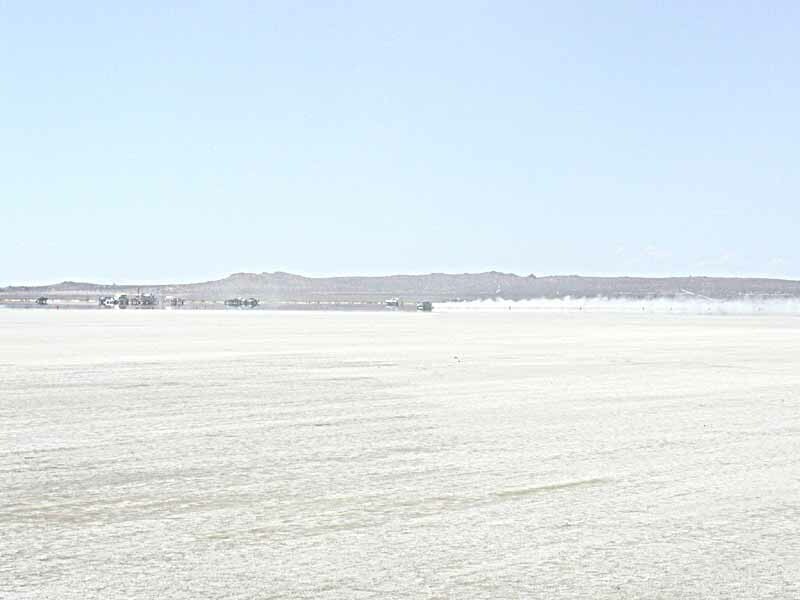 Theres a great book about Bonneville called Bonneville Salt Flats, by Landspeed Louise Ann Noeth published by MBI publishing. Theres more info at the Southern California Timing Association website http://www.scta-bni.org/, and at another great site called Roadsters.com.